Centuries of stand-up experience have been condensed into Off The Mic, with an impressive roster of comedians from both sides of the Atlantic sharing wisdom about all aspects of their craft. The result is a detailed look at how comedians started in the business, write and structure material and develop a persona, which would make an invaluable introduction for anyone hoping to enter the business. But it also goes deeper into such aspects such as getting into a headspace for performing and developing a relationship with an audience based on a delicate balance of status that offers an astute insight into the intriguing psyche of stand-up. Authors Deborah Frances White, a comedian and improviser, and Marsha Shandur, a former radio presenter who's covered the Edinburgh Fringe and produced a series of podcasts interviewing comics, are both clearly fascinated by every nut and bolt that goes into a comedy performance. An underlying theme is that that a gig is the most unnatural of situations, with comics overcoming all primal instincts not to be the one outside the herd to go into the spotlight, hold attention and seek laughs without appearing to be trying too hard – and that to achieve that takes a very specific combination of personality and training, learning on the fly. Contributors include Eddie Izzard, Stewart Lee, Sarah Millican, Greg Davies, Marc Maron, Todd Barry and Paul Provenza, whose own book Satiristas is occasionally plundered (with permission) for an apposite quote or two. The book starts with an exercise in finding stand-up inspiration, which mistakenly gives the idea this is another 'how to guide', but after a few scattergun pages settles down into extracts from their interviews themed on the likes of 'getting started' or 'owning the room', each full of smart nuggets of information. To vary the pace these are interspersed with longer interviews with a single subject that paints an even more vivid picture of what the job of stand-up entails – and how its best exponents push boundaries to get better at it. This should be on the shelf of every comedy geek, next to Satirista's, Steve Martin's Born Standing Up, Stewart Lee's How I Escaped My Certain Fate and Oliver Double's Stand-Up! 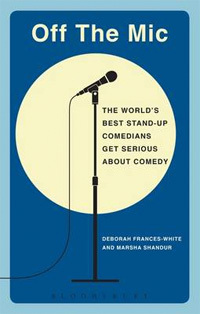 • Off The Mic: The World's Best Stand-Up Comedians Get Serious About Comedy by Deborah Frances White and Marsha Shandur was published last month by Bloomsbury, priced £14.99. Click here to order from Foyles.